This morning when I knew I had a weekend remix to do, I was wracking my brain trying to think of something to feature. I just couldn't think of anything I'd worn frequently on my blog. So I took to some super-sleuthing. I went on my Chictopia page and looked through all the outfits I'd posted on there and noted down things that kept coming up. This cardigan, it seems, is one of the most frequently-worn pieces in my wardrobe. 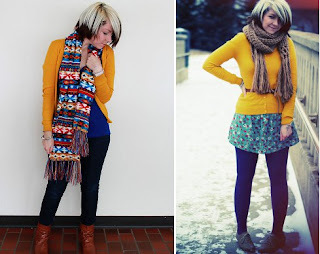 I seem to wear it a lot in the autumn and spring, and its gorgeous mustard colour has called for many an autumnal-looking outfit, which has really inspired me for this season. I've definitely become more obsessed with mustard recently with the addition of my mustard jeans (which I am wearing right now!! 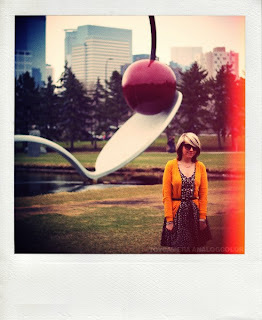 ), mustard blazer and many other mustard pieces, but it seems I've been loving mustard for over a year now!! Sorry this photo-collage is really awkward. I had a lot of photos that weren't full-length and a lot of them looked a bit odd next to full-length photos so I did what I could while keeping the photos chronological. I didn't realise how much I wear this cardigan, but I guess it just goes with lot of my clothes! 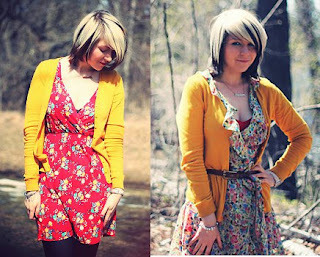 I must have a lot of pieces with yellow tones or yellow prints in them. I think my favourites are outfit two (that colour combination is inspiring me so much for the new season!! ), outfit three, outfit eight and outfit eleven. These photos have some really great memories, I seem to have worn this cardigan for some really great times. I'm glad I chose this cardigan for this week because now I'm all inspired for wearing lots of autumnal colours. That cardigan is fabulous. 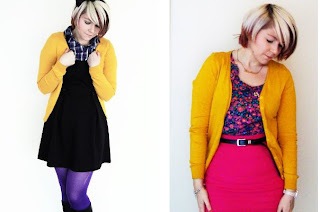 I need to find autumnal cardigans! I think my favorite outfit is six. So pretty! That is one hard working cardigan. I really like the 3rd outfit too.